dm will use Demeter's newly launched label for its organic private label line dmBio. German drugstore leader dm has announced a partnership with Demeter, the largest certification organisation for biodynamic agriculture. The organic association already has an organic label which it only uses for its own products. It has now developed a seal which can be used on retailers’ private label products to endorse their organic credentials. The new label goes further than the EU Bio label but it is said to not have the same strict guidelines as the Demeter brand itself. dm will be the first partner to use the new biodynamic Demeter seal. The German organic market is at the centre of attention these days. 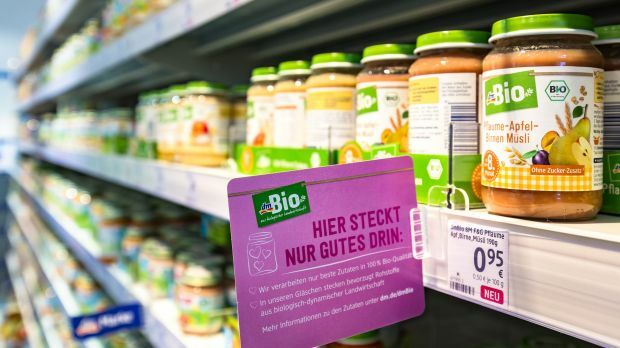 As reported earlier this year, discounter Aldi has reportedly become the market leader for organic products in Germany, in terms of sales. This must have been tough news for organic supermarket chains such as Alnatura and Dennree to bear – but also for the number one drugstore operator dm, which has managed to become a destination for organic food lovers over the last few years. The introduction of the new organic label is undoubtedly intended to further boost the popularity of its products, as they will follow even stricter guidelines. The partnership could be interpreted as a reaction to Aldi’s leadership and the increased efforts of discounters and supermarket operators alike in this field. 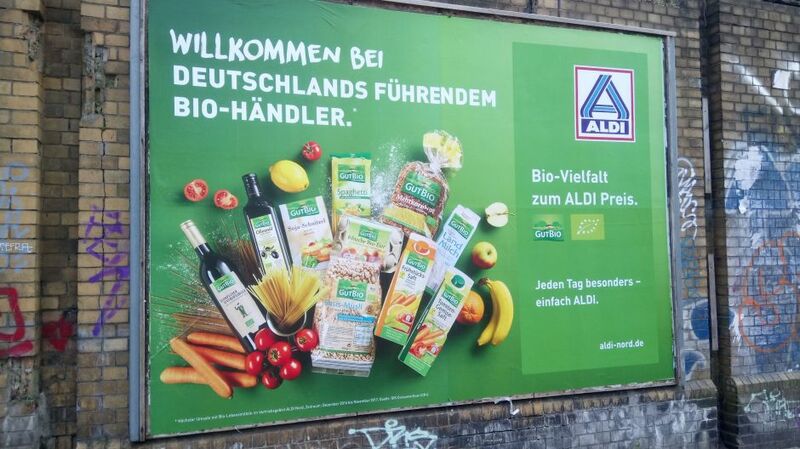 Aldi – Germany’s largest value chain in terms of sales – is increasingly using the fact that is has become the top destination for organic goods within its marketing, as can be seen in the picture. Aldi is increasingly using the fact that is has become the top destination for organic goods (in terms of sales) within its marketing. With a discounter becoming the new lead in this niche sector, it is likely that margins for the goods have come under huge pressure. dm is the price leader in its core segment but it seems to be unable to compete on price with the discounter in the organic category; or perhaps it is afraid of causing a race to the bottom. The logical consequence is to attempt to further boost category attractiveness and the quality criteria for the products in question, while keeping prices low. No doubt easier said than done! The initiatives of the price aggressive chains has also affected the success of the specialist organic grocery store chains in Germany. As reported by Lebensmittel Zeitung, German organic supermarket operator Dennree reported a net sales increase of 5% in 2017. This is still a relatively high growth rate, however when compared to the 10% and 17% achieved in the preceding two years, we can then see that the curve is slowly getting flatter. In general, the specialist players welcome the current focus on organic products as it means more traffic to their own stores. However, the other side of the coin is decreasing product prices – and the need for these stores to reinvent themselves because organic is no longer a USP in its own right. One of the players looking particularly under threat in terms of losing their uniqueness is Migros’ owned German operation Tegut. The supermarket chain has a strong organic focus, with more than 25% of its sales coming from such products. What used to be a differentiator for the not-so-price-aggressive chain – selling a large proportion of organic items next to the leading manufacturer brands – is increasingly becoming something that shoppers can even find at the discounters. As a result, Tegut is currently overhauling its organic private label products as the assortment comprises only 160 SKUs at the moment. The plan is to expand the range with more products in fresh categories such as diary, meat and bakery products. We think that this is much needed given that Tegut is now more dependent on its suppliers; and can then also benefit from better margins. With contributions from Senior Retail Analyst Denise Klug.